One of the primary complaints regarding some of the new ballparks is the lack of cantilevering. Cantilevers are the long projecting beams underneath the upper decks that support the extension of the decks farther out, closer to the field, above the lower deck. Some decks today only have a slight overhang, forcing the upper deck to be farther from the action. In fact, some of the new HOK (Populous) parks place fans just as high and far from the action as their derided cavernous predecessors, under the guise of a cozy retro aesthetic. In an extreme example, according to Josh Levin in Washington City Paper, Nationals Park is actually 21 feet higher and farther than RFK, as well as being further back horizontally! That being said, cantilevering the upper decks dramatically over the field is not the answer either. It’s a very delicate balance. The closer you bring a deck to the playing field, the higher it will have be in order to avoid overhang issues. Also, it’s difficult to bring the upper deck close to the action without increasing the rake (steepness) or obstructing a major portion of the field. Renovated Old Yankee Stadium had an upper deck that was completely cantilevered over the mezzanine, but there were significant obstructions. Down the lines, you couldn’t see almost 50 feet of the field. Old Yankee Stadium. The upper deck was so close to the field that the corners of the outfield were obstructed. This is an extreme example, as Citi Field isn’t this bad. It’s a tradeoff. The challenge is to find the perfect balance. Comparing Citi Field and Shea Stadium is a perfect case study and a source of great controversy. Citi has seating much closer to the action than Shea, and naturally, there are some seats where parts of the outfield are obstructed. Not used to this fact, there were many complaints from fans, despite the fact that this is common in new ballparks. Where the decks are reasonably close to the action, you aren’t going to be able to see parts of the outfield at times. Outfield upper decks always have significant obstructions in the outfield, unless you want to be sitting a mile away from home plate. With Shea Stadium, you were so far from the field in the upper deck you could see most of the box seats below you. At Citi, many fans didn’t like the partial outfield obstructions that result in moving the decks closer to the infield. Citi Field vs. Shea Stadium. Citi Field is closer to the action, but has received some complaints from fans not being able to see the outfield obstructions. Note the last row in the upper deck at Citi is closer than the last row in the mezzanine at Shea. Mets fan definitely got a win here. You’ll note you’ll never find an RFK Stadium vs. Nationals Park cross section comparison! 1) The more the upper decks are cantilevered over the field, the more significant the (a) overhang obstructions below and the (b) outfield obstructions above. The central benefit is that you are closer to the playing field, specifically the infield. 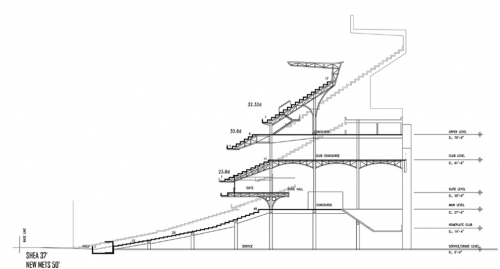 Also consider that the more the upper decks are cantilevered over the grandstand, the worse visibility there is from the open concourse below. Rangers Ballpark in Arlington is one of the worst in field proximity with a lack of cantilevers, but suffers from little overhang obstructions below. Miller Park is similarly poor in field proximity as well. Ballpark architects, such as HOK (Populous), are in a tough spot and must achieve the perfect balance. But someone is always going to end up unsatisfied. Contrasting Philadelphia and San Diego, its clear that the team officials usually have the say. 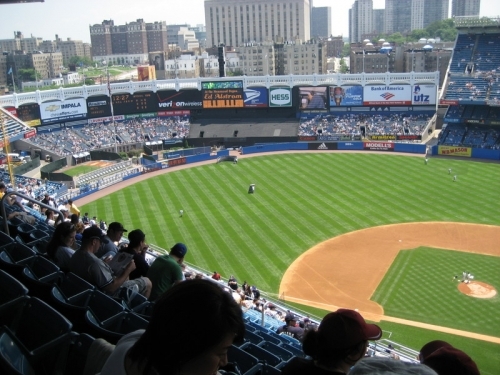 You hear ballpark aficionados, like me, always advocating for aggressive cantilevers that bring the decks closer to the action, but there is a strong sentiment against that as seen by the Mets case study (though Mets fans were also complaining about infield obstructions by portals, railings, and staircases throughout the upper deck). That being said, I am in favor of using more aggressive cantilevers than are currently being used. It makes much more sense from a sightlines perspective. The pros greatly outweigh the cons. Why would you place priority in seeing certain parts of the outfield that rarely come into play over closeness to the infield action? The wide majority of the action takes place in the infield. As for being under an overhang, how often do you follow the ball in the air? People generally just watch the outfielder and are able to gage the fly ball from that. I do understand the argument that it is a much more pleasing experience to be open to the sky. Sitting under an overhang on a beautiful night can significantly hamper the ambiance. So keeping the seats under an overhang to a minimum is ideal. 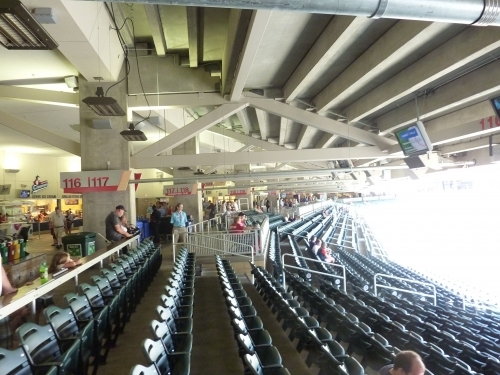 Minute Maid Park accomplishes this balance reasonably well, albeit by raising the upper deck very high off the ground, higher than its peers. The difference is subtle. You have an open atmosphere without that claustrophobic feel because the decks are so high above, while still admirably cantilevering the action over the field. Petco Park has the best field proximity of all the new parks. Petco Park has the most aggressive cantilevers of the new ballparks, which is what I see as the perfect balance. Anything more would be too much. They also had to raise the mezzanine higher off the ground, but the height issue is mitigated because there is no separate suite level. 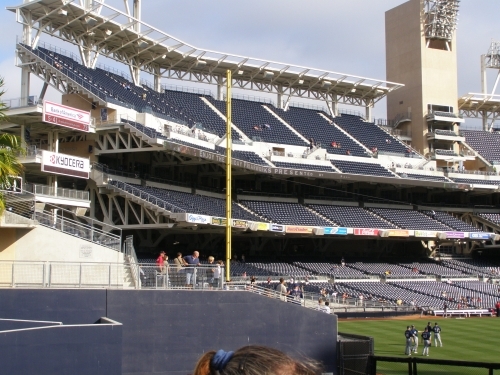 On the surface, the Padres have the best sightlines in baseball, but have some individual seat obstructions by the towers/warehouse. Busch Stadium and Minute Maid Park are also well done for the most part. 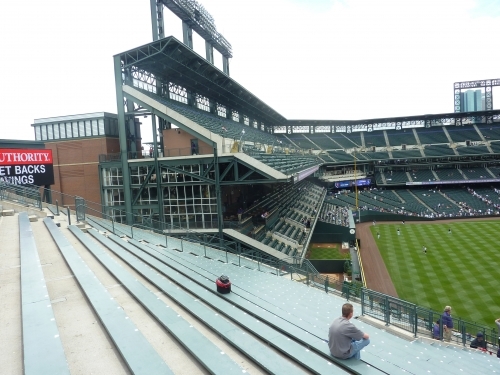 Newer ballparks need to use these ballparks as a guideline for cantilevering the upper decks, instead of using the “stepped effect” seen in most.